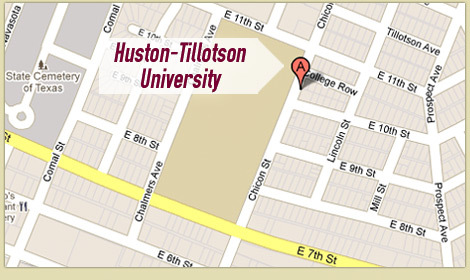 6 p.m. – 8:00 p.m.
For over 143 years, Huston-Tillotson University has been the cornerstone of the East Austin community. Now, Huston-Tillotson even has a second location in East Austin, the Center for Entrepreneurship and Innovation, to help jumpstart women and minority-owned new businesses and provide an all-new MBA program this fall. Huston-Tillotson University increased its enrollment to over 1,100 students and formed many meaningful partnerships with such notable organizations such as the Texas Parks and Wildlife Department and Merck and Company. At Huston-Tillotson, students get to enjoy a family environment with an array of majors, clubs, organizations, and sports from which to choose. Huston-Tillotson will kick off the Homecoming week with worship service at Greater Mt. Zion Church on Tannehill Lane. The week continues with student-focused activities inspired by television’s BET Experience. The week ends with alumni activities on and off campus, sponsored by the Huston-Tillotson University’s International Alumni Association and Young Alumni group. Special on Friday are a pep rally and the revealing of the first-ever Huston-Tillotson University class ring (orders can be made on location). On Saturday morning, the Homecoming Festival begins across campus, offering family entertainment, food, crafts, and much more. Then, there is the main event that caps off the week of celebration, a big conference basketball game versus Paul Quinn, in the Mary E. Branch Gymnasium. “The Branch” received an update with an all-new floor, doors, bathroom facilities, and more, made possible by a grant from Austin’s “A Glimmer of Hope.” At 4:00 p.m. on that Saturday, Glimmer representatives will join Huston-Tillotson’s officials for a ribbon-cutting at the gym. Tickets for the paid-entry Homecoming events are here. If interested in being a vendor or performer at the festival, contact Linda Y. Jackson at lyjackson@htu.edu or 512.505.3006.